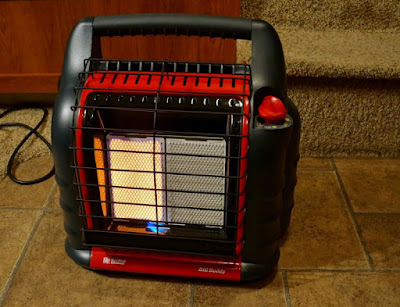 We bought the Big Buddy heater as a backup and day time heater to help save on propane and the batteries we used it as the sole heat source on our last trip at 9100+ ft with nightly low's in the 40's and for most of 1 day when we stayed inside because of rain. This heater at a max of 18,000 btu's has no problem warming up our 30' fifth wheel. We did not run it over night and we keep a roof vent open when using it and sometimes a window. If there is not enough ventilation these will either shut down or not even stay lit when lighting them. As a bonus they have a quick coupler so you can use a hose and plumb them right in to the RV's propane system. Over our 5 nights we were there and the one daytime we used it we only used 4 of the 1 lb cylinders so not to bad at a cost of about $13.00 for the cylinders no that I know it will work I will spend the money to plumb it in and just run it off our 30 lb cylinders.